Dog Daycare - UNLEASH YOUR BEST FRIEND. Treat your dog to a fun and active day of play! Is your dog lonely, stressed and bored because he's left home alone all day while you're at work? For many dogs, chronic isolation can lead to serious and unwanted emotional or behavioral issues, such as separation anxiety. Dogs are pack animals - they crave companionship and stimulation. At Northshore Canine Academy, a professional dog training facility, we offer doggie daycare to keep your pup stimulated! We ensure your dog has tons of fun while providing plenty of mental and physical stimulation along with proper socialization with people and other dogs! Your dog will enjoy plenty of room to run and play while getting plenty of fresh air and sunshine. With NCA daycare, who needs a dog park!? Your pet will receive supervision by professional dog trainers. Separate play areas for large and large dogs. Both groups receive outside play time in our large, fenced play area! We provide structured daily routines that include treat times, play times and nap times. Your pet will enjoy multiple supervised outside play sessions per day. Fun games like fetch and Frisbee are included! During the summer months, your pet can enjoy playing in our SplashZone, which has fun sprinklers and a refreshing pool! Then your pet can enjoy a nice frozen treat under the shade of a pine tree. During the fall and winter months, your pup will enjoy plenty of outside play, paired with a variety of interactive, indoor and outdoor brain-games. Your pet can also enjoy a warm winter treat while curled up by the crackling fireplace! Your pet(s) must be up to date on the following vaccinations: Rabies, Annual Bordetella (kennel cough), DHLPP (distemper, hepatitis, leptospirosis, parainfluenza and parvovirus). Spay and neuter is not required, however, no dog(s) in heat will be accepted. To ensure that all of our guests have a healthy and happy stay at NCA, we require all daycare guests to complete a comprehensive behavioral assessment during their first day of doggie daycare. Social skills, play style and temperament are evaluated and are continually supervised each day. Hello! My name is Nala. I'm a puppy who was found dumped in a Walmart parking lot in September of 2017 by one of my mom's former training clients. My mom and dad advertised for weeks trying to find my first owner but nobody ever claimed me. They then decided to "temporarily" take me into their home so that I wouldn't be sent to a horrible animal shelter, but when they got me home, they fell in love and I instantly became part of the family! Mom and dad tell me that I'm very energetic! I will play all day long until I crash on one of their comfy couches. I like to spend most of my days playing fetch, Frisbee and chase in our huge back yard! I love it when other dogs come to stay and play - I make best friends with big dogs and small dogs! If you like to run and play, come visit and we will have a BLAST! Hi, my name is Diesel. I'm a three year old German Shepherd who my mom rescued from a shelter in Montgomery, Texas. I have been told by mom that I'm very "non-reactive" and because of that, I help her rehabilitate aggressive and scared dogs. I've also served as an Ambassador Dog at a local VA Clinic. Like my new sister, Nala, I like dogs of all breeds and sizes. In fact, I've never met a dog I didn't like or want to help! I'm a little less energetic than Nala though. I will run with the best of them but only for a little while. Then I like to go lay down on the couch or in the shade while I watch the other dogs play. Mom says I "monitor" other dogs like a big brother. If you come to play, let me know when you're ready to relax and I'll show you how to rest without a care in the world! 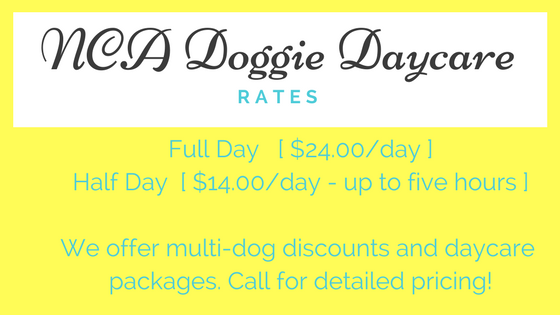 Interested in enrolling your dog in a training program while at Doggie Daycare? Check out our Day Training Program!